The BMW X3 is one of the top SUVs in the luxury compact class, as rated by US News & World Report. Drivers state that this SUV is unlike any other in the class with all new options for performance and technology that weren’t included with the previous versions. 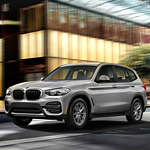 As of 2018, the BMW X3 has been totally redesigned with a new modern look that is making heads turn on the highway. The most beautiful feature of this new SUV is the head lamps and grill, which have been totally changed. You can also see the changes in the technology options, which now include lane departure assist, blind spot monitoring, and traffic alerts. If you are also thinking about higher performance, the base engine in the X3 puts out 245 horsepower. You can upgrade to other trims that go up to 350 horsepower. Want to test drive the latest X3? Stop by BMW of Nashville.